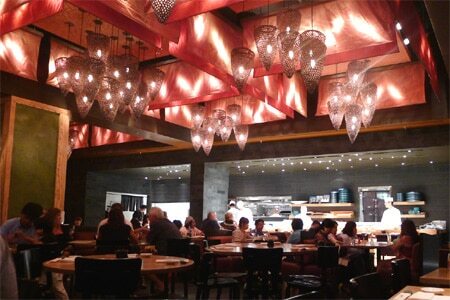 The Honolulu outpost of chef Nobu Matsuhisa. : Nobu in the Wakiki Parc Hotel offers a similar menu as the other links in chef Nobu Matsuhisa’s international chain of Japanese-Peruvian fusion restaurants. Diners can choose to sit at the sushi bar or at simple wooden tables. Overhead, light fixtures built to look like fishermen’s baskets reflect off rosy shades and provide a seductive glow that serves to make everyone one of the "beautiful people." Even though there are more than a few first-rate sushi spots in Honolulu, sushi aficionados can appreciate the freshness and quality here. Options range from basic tuna rolls to more intricate and creative, though less traditional, inventions. The signature yellowtail sashimi is dotted with slices of jalapeño, while hot dishes include black cod served atop butter lettuce and scallops with wasabi pepper or spicy garlic. Meanwhile, a brick oven turns out duck breast with a wasabi-enhanced green salsa, pairing the unctuous duck meat with the bracing tang of wasabi. Omakase menus present a more comprehensive tasting priced at $100, $125 and above per person. Desserts might include a bento box with flourless chocolate cake and green tea ice cream; and vanilla flan, ume raisins and pound cake toast. The wine list is adequate, but we suggest ordering from the saké list to complement your meal.